This report aims to explain why podcasts matter to digital journalism: as our world shifts to one of mobile consumption, podcasts represent a form of mobile-first content that engages with audiences in ways that no other mobile medium has previously. This guide provides a detailed overview of the current podcasting landscape, which is characterized by industry disruption, new networks, increased podcast listening (especially on mobile devices), and heightened consumer awareness. As part of this overview, I describe the conceptual and technological challenges that podcasting must overcome if it is to achieve meaningful growth and industry legitimacy. I also briefly outline the challenges the industry faces as it looks to the future: the issues of iTunes as a gatekeeper, the short-term and long-term efficacy of networks, the ethical dilemmas that native ads and branded content pose, and the need for more creativity and diversity in content creation. Podcasts are pursuing multiple revenue streams, including advertising/sponsorship, foundation support, direct support, subscription models, and live events. While advertising is currently the fastest-growing and most lucrative stream, these last three streams attempt to convert audience engagement and loyalty into recurring donations. Because there is no one-size-fits-all solution for generating revenue, and each podcast/company follows a different business model, it’s important to consider the operational philosophies that inform how podcasts and networks raise revenue and prioritize revenue streams. This guide explores the myriad ways these philosophies play out in four case studies: PRX’s Reveal, Gimlet Media, BuzzFeed, and Panoply. It is still too early to declare any podcast or podcast company a “success.” Many podcasts/networks currently rely heavily on advertising and are still experimenting with alternative revenue streams. Outside of advertising and branded content, podcasts show the most potential as an audience engagement tool that can diversify content, add value to brands/consumers, and generate enthusiasm for direct support and/or freemium models. In 1999, a few developers at Netscape had an idea for how to aggregate content from a variety of sites so that a reader would never have to visit any one individually to check for the latest updates. Instead, the content would appear in one place automatically.1 They launched a prototype technology and called it RDF Site Summary.2 Today, we know this technology as RSS (Real Simple Syndication). Then the buzz subsided. Podcasting went under the radar, so to speak, but it was growing slowly and steadily all the while. By 2014, Apple had one billion podcast subscribers. Edison Research reported that now 48 percent of all Americans knew the term podcasting and 30 percent had listened to a podcast before.8 Then in October, This American Life launched a spin-off show—one that would be released in installments, or serially—each week. It was called Serial. Secondly, many journalists covering this space overlook a vital factor in Serial’s success: just a few weeks before the show’s launch, Apple updated its mobile operating system, iOS, to include a native, undeletable podcast app. Thirdly, despite the fervent media attention, Serial did not prompt a significant spike in overall listener growth for podcasts more generally. 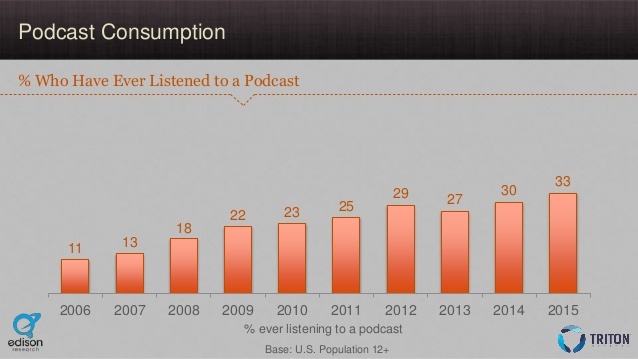 As Edison Research’ The Podcast Consumer 2015” report shows, although people are now listening to more podcasts, overall audience growth has remained slow and steady for the past decade. Today, a third of the American population has listened to a podcast at least once.15 However, these numbers are still nothing in comparison to terrestrial radio’s: Over 91 percent of Americans listen to the radio each week, and advertisers spend billions of dollars on radio each year (radio is a 16-billion-dollar industry).16 Podcasting is still far from meeting radio’s dominance in terms of audience penetration or financial investment. However, despite all the interest, few creators/outlets seem to know if podcasts can be economically viable. While many articles have focused on the potential of podcasting to grow audiences and earn revenue, there has been no comprehensive overview of how podcasts/networks are earning revenue today. The purpose of this guide is to do just that—to illustrate the state of the podcasting landscape in 2015, and to address the following central questions: Do podcasts generate revenue? How? What are the existing business models? And are they sustainable over the long term? What are the business models currently in operation? To what extent have these business models proven successful? Do these business models seem viable/resilient in the long term? There is no one directory that includes all published podcasts available for study. The largest podcast directory is iTunes US; however, Apple has not published a dataset with this information. In June, I analyzed the Top 100 iTunes charts (cognizant that the top 100 does not mean the most downloaded, as iTunes rankings are sorted according to a private algorithm) and researched how each of these podcasts raises revenue. I did not, however, create a sufficiently large dataset from which I could draw overarching conclusions (for this type of analysis, I recommend you read sociologist Josh Morgan’s piece on Medium21). I built on this first phase of research by undertaking a review of the available literature, drawing particularly on industry reports such as Edison Research’s “The Infinite Dial 2015” and “The Podcast Consumer 2015,” and Clammr’s “Future of Podcasting 2015.” I also undertook a number of interviews with podcasting professionals, attempting to interview a wide variety of stakeholders involved in the business side of podcasting, including academics (NYU Professor Robert Boynton), market researchers (Edison Research’s Tom Webster; Clammr’s Parviz Parvizi), advertisers (MailChimp’s Mark DiCristina), tech providers (Libsyn’s Rob Walch; Acast’s Caitlin Thompson; Stitcher’s Noah Shanok), network executives, and content creators. As well as understanding its business, I wanted to investigate podcasting from the perspective of individual podcast creators and those networks which produce multiple podcasts. I devised an initial list of interviewees based on my spreadsheet of the Top 100 podcasts (choosing those that had particularly successful, interesting, or unusual revenue streams/trajectories). As I conducted these interviews, I employed a snowball sampling technique, asking participants to recommend other interview subjects, thereby expanding the list based on those recommendations. This list included representatives from individual shows (Reveal, Intelligence Squared, Song Exploder) and the following networks/companies: Gimlet Media, Midroll Media, Panoply, Infinite Guest, Audible, BuzzFeed, PRX, the Australian Broadcasting Company, WBEZ, and New York Public Radio. Toward the end of my research, I sought out information from podcasters who could fill certain gaps in my research; for example, The Heart’s Mitra Kaboli and Israel Story’s Benny Becker answered an email inquiry about running live events, and Yes Means Yes’s Jaclyn Friedman and Lore’s Aaron Mahnke gave me insight into running podcasts without network support. Because this report gears toward a journalistic audience (both individuals interested in launching/sustaining podcasts and media outlets interested in pursuing podcasts), there are some significant, important subsets of the podcasting community that are conspicuously underrepresented—most notably comedy podcasts, talk radio podcasts, and self-help podcasts. I should also stress that this is a U.S.-centric report; because most media in the United States is privately funded, the expectations of consumer/foundational giving are substantially different than in countries with strong governmental support of media. Also, due to the fast-paced nature of this sphere, which changes on a daily basis, and the time required to publish, I should warn the reader that this report may be missing relevant information released after the final draft was submitted. Podcasting’s present and future, particularly its business models, are relevant to digital journalism for two major reasons. First, podcasting is a medium that lends itself to mobile consumption, and thus provides a means for reaching audiences in ways other media cannot. Second, podcasting offers a level of engagement with audiences that is incomparable with other digital media; it thus presents a remarkable opportunity for journalistic outlets to cultivate audience relationships and experiment with new forms of revenue generation. According to a report on mobile technology trends from KPCB, Americans now use their smartphones more than any other device to access the Internet—and it’s a trend that appears to be on the rise.22 Similarly, mobile listening is by far the predominant method of podcast consumption today (63 percent of Libsyn-hosted podcasts were requested from mobile devices in 2014, up from 43 percent in 2012, according to Libsyn’s internal data), and it continues to grow month by month.23 Podcasting should be considered a mobile-first medium. As such, podcasting offers an alternative vehicle for journalism: one which is easily accessible on mobile phones (where more and more consumers spend their time), privileged at certain hours of the day, and has the unique characteristic of eliciting consumers’ close attention. An Antidote to Advertising in the Internet Age? Creators are fond of describing podcasting as still in its “Wild West” stage, a time when the rules haven’t been formulated (let alone enforced) and everyone is—in terms of content, metrics, advertising rates, and business models—flying blind. This concept underplays the extent to which podcasting technology, storytelling, and revenue creation has evolved since its emergence in the early 2000s. Second, it elides the legacy of radio upon podcasting, most particularly the strong influence of both talk radio and public radio on its formats and revenue streams. On the level of distribution and production, podcasting has unquestionably disrupted radio, hurtling the major players into a state of flux. Whereas local stations once relied on major distributors such as NPR for content, and producers were equally dependent upon them for reaching large audiences, the digitization of audio has rendered traditional distributors unnecessary. PRX, the public radio exchange, has pivoted from a station marketplace into an online platform where producers can upload their work directly for stations to download. What’s more, stations are no longer the only outlets for creators; creators can share their podcasts on a variety of platforms, some of which allow them to reach audiences and earn revenue directly. Despite the uncertainty rife within the space, podcasting is making significant strides toward mainstream legitimacy as an industry. Central to this acceptance, of course, is achieving a critical mass of listeners. All interviewees discussed this fact: Podcasts need bigger audiences. To reiterate Bowers’s point, “once you get them, they tend to stay around.”41 However, the “getting them” remains the challenge at hand, and podcasting still has significant barriers obstructing its audience growth. Despite the work that Serial has done to make podcasting better known among the public, the concept of podcasting remains foreign to many listeners. Indeed, it could be argued that podcasting remains in an “early adopter phase.” A Midroll white paper shows that 67 percent of podcast listeners are 18&ndash;34 (to compare, only 30.2 percent of radio listeners fall in this demographic).42 The podcasting audience skews toward the under-40s, a generation for whom the concept of on-demand content makes sense. Even though many platforms, such as SoundCloud and Acast (which both stream audio), have sophisticated analytics, the fact remains that the majority of podcasts are downloaded through iTunes (roughly 70 percent).61 Once a podcast is downloaded, there is no way of knowing what happens to the file, how long it was listened to, how many times, or when. Moreover, since the subscribers “belong” to iTunes, creators have little knowledge of their listener demographics. Although advertisers like DiCristina have come to terms with limited consumer data for downloaded podcasts, there is, at least, some progress around better understanding listeners who stream podcasts. At WNYC, van Mosel has already overseen the conversion of ads into dynamic, programmatic ads, which can be continually trafficked into shows’ back catalogues (where about 40 percent of listening occurs, vastly increasing ad impressions).67 These ads also include tracking pixels that advertisers can use to ensure ads are delivering; as van Mosel explained, it’s a “lifeline to say ‘legitimacy is happening here.’”68 Acast similarly injects trackable ads at point of play, and Panoply recently acquired the tech company Audiometric in order to offer a similar technology (for more on this, see the Panoply case study). As any media outlet in the 21st century is more than aware, diverse sources of revenue are necessary for long-term sustainability. Outlined below are four major sources from which podcasts and podcast networks generate revenue: advertising and sponsorship, direct support, foundation support, and membership/subscription models. Also mentioned are a few streams that, while generally less lucrative, are easy to implement or serve strategic purposes, such as live events and partnerships. The division between these categories is somewhat arbitrary (what, in essence, distinguishes a wealthy individual’s large donation from a foundation’s small contribution? ); however, I have borrowed these categories from interviewees who explicitly mentioned the following revenue streams in these terms. More important to note is that each podcast/network finds its own balance between these sources—some depend significantly on advertising while others maintain public radio’s “three-legged stool” philosophy (in which three revenue sources—usually advertising, direct support, and foundation support—are conscientiously and purposefully given equal weight). From the beginning, podcasts have leveraged their direct audience relationships by asking for listener support via donations or pledges. Taking a cue from public radio, the Maximum Fun network does yearly pledge drives and has a tiered membership model, for example. However, while Kickstarter is a tremendous opportunity to raise both funds and media attention, it’s by no means a sure bet. A brief glance at the Kickstarter audio and radio/podcast pages shows dozens of Kickstarter ventures that failed to attain their goals. A successful Kickstarter campaign requires strategic and time-intensive marketing initiatives. Not-for-profit podcasts in particular have found success in cultivating grants from foundations that align with the podcast’s content or mission. For example, Radiotopia was awarded a one-million-dollar grant from the Knight Foundation in May to develop new shows and reach new audiences.76 Of course, grant money often comes with strings attached; foundations generally give money on the condition that content producers cover certain topics/issues. For shows that are more than conversation-based, and thus take more time to create and produce, tours offer greater opportunities for revenue generation than singular events, as the same show can serve for multiple ticket sales (although obviously, they require greater time commitments and logistical planning). Spaces are often donated, and sponsors can help offset costs, either in the form of money or food/drinks/decorations, etc.80 Of course, for shows within networks, sponsorship must be coordinated through the network, which can sometimes limit shows’ options. All in all, live events are a great way to engage audiences but a difficult way to consistently generate revenue unless you are willing to seek out sponsorship and perform multiple iterations. Less common, although potentially interesting sources of revenue are classes and workshops in which podcasters leverage their positions as experts in certain subject matters or their knowledge as audio content creators. For example, Gimlet’s Alex Blumberg offers a class on audio storytelling for purchase on creativelive.com. And, although none of my interviewees cited these as major revenue makers, many podcasts also sell merchandise on their websites and earn money from Amazon’s Associates program (which gives podcasts kickbacks for referring listeners to amazon). Go to the website of the Center of Investigative Reporting (CIR) and a window quickly pops up, redirecting the visitor to the center’s “new home”—revealnews.org—where you can find CIR’s reports, radio show, and podcast. What was once the Center of Investigative Reporting has today been rebranded as Reveal, a new identity with a podcast at its heart and center. Podcasts can allow you to own a relationship with your audience and engage with listeners directly. Podcasts can provide another platform for reaching consumers, one which can be used in conjunction with other media formats. Podcasts can offer a way to diversify revenue streams, including direct support from audiences. Radio broadcasting and podcasting are not mutually exclusive; both can be used to earn revenue and reach audiences. Audience growth remains a significant challenge, one which networks can help shows to overcome. Journalists must exercise caution when choosing sponsors in order to maintain credibility. Over the last few months, I sat down with some of the biggest players in the industry and asked who, in their opinions, is doing the most innovative work in podcasting. Almost everyone I interviewed invariably referred to one company: Gimlet Media. Considering the considerable media attention Gimlet has garnered (and the fact that its origin story is eloquently articulated in season one of its show StartUp), I will use this case study to briefly explore why Gimlet is so admired and the ways in which it has (and hasn’t) disrupted the public radio mentality. The economics of the web today are brutalizing because it’s a numbers game. You have to make an enormous amount of content to make up for the fact that the numbers are quite low […] that’s not a world I want us to enter. I think there are a couple of things that are different about podcasting. One is, in today’s world, the amount of premium content that’s extremely high quality is kind of scarce. That helps us. I also think the ad unit in podcasting is fundamentally a better ad unit than display ads. It’s baked into the show, it’s read by the host, and when you do a good job, listeners want to hear them. I could open up the Twitter feed and read the people who say, “I love your ads.” They’re entertaining and interesting. Part of the limitations of the Gimlet model, of course, is that production is slow. In order to maintain its standard of quality, the network has only launched three shows so far. Unlike Panoply, which partners with various media publishers to help produce podcasts (often conversational shows that align with existing content, and thus require less preparation and editing), Gimlet producers craft each show in-house, reporting and editing both the content and the ads. Moreover, the shows have not significantly departed from public radio in terms of content (whether this is even desirable, of course, is up for debate). Podcasting offers ways of experimenting with advertising and an opportunity to stand out from the online-mobile advertising sphere. CPMs remain malleable, especially when the advertising content is bespoke (in this case, advertising can become an important revenue stream). When a podcast’s numbers reach critical mass, the show can develop direct relationships with advertisers. If networks are to maintain talent, they must super-serve their creators. Gimlet is betting that scale will follow quality. Podcasts can be used to diversify content and add value to online audiences. Outlets can tap internal talent as a way of creating new content. A strong brand identity and audience can ensure advertiser interest. It’s possible to establish a line between editorial and advertorial, though ad quality may be sacrificed. Podcasting rates are still in early days; CPMs need not be the only method of advertising revenue. In August 2015, the podcast network Panoply announced that it had acquired a software product named Audiometric, “a producer-focused podcasting CMS and ad insertion technology.”109 To the layman, this might sound like an innocuous move. To the podcasting insider, the acquisition offered a major insight into how Panoply, already one of the biggest players in the field, is strategizing its future growth. The technology’s capacity for more accurate analytics is one of its core advantages. Panoply’s Nick Quah hopes that the detailed analytics will not just allow creators to better cater their shows to their audiences, but also push podcasting more fully into the world of digital journalism.120 What’s more, of course, the more accurate the metrics, the more advertisers will invest in the space (unsurprisingly, Panoply is also on the IAB working group focused on establishing industry standards for podcast ads). Although the technology has been designed for the use of those within the Panoply network, Bowers told me he could “envision a future” where people outside the network can access the technology—presumably for a fee.121 For Panoply, which has ads at the core of its business, this technology play represents the company’s move toward a more independent business model. Not only does it decrease the network’s reliance on outside technological platforms, but it also creates a potential alternate revenue stream to advertising as it amplifies the possibility for increased advertising revenue through its dynamic ad injection. For publishers (particularly big name publishers) interested in producing podcasts, Panoply offers an interesting, low-risk way to enter the space. Branded content could be a viable way of earning advertising revenue beyond CPMs. Panoply believes strongly that podcasts allow publishers a way of creating engaged, loyal audiences that can support freemium models. For now, Panoply remains advertising-reliant; possible future revenue streams include freemium models, as well as paid access to its technological platform. Outlined below are a number of key takeaways, gathered from across the above case studies, addressing four critical areas for podcasting: advertising, audience engagement, diverse revenue streams, and networks. When a podcast’s numbers reach critical mass, a show can develop direct relationships with advertisers (and keep 100 percent of the revenue). A strong brand identity can ensure advertiser interest. CPMs remain malleable, especially when the advertising content is bespoke. CPMs need not be the only method of earning advertising revenue. Podcasting offers ways of experimenting with advertising and an opportunity to stand out from the online/mobile advertising sphere. Journalists must exercise caution when choosing sponsors if they are to maintain credibility. It’s possible to establish a line between editorial and advertorial, though ad quality may be sacrificed. Engaged, loyal audiences are more likely to support freemium models. Podcasts can be used to diversify content, providing another platform for reaching your consumer. Podcasts can add value to online audiences and brands. Live shows can be used to build audience/host community. Podcasts can offer a way to diversify revenue streams, including direct support from audiences and subscription models that offer premium content. Three operating philosophies emerged from the interviews conducted for this research. They are by no means hard and fast categories; indeed, they are general “philosophies” that influence the ways podcasts and podcast networks raise revenue and prioritize revenue streams. As such, one podcast can operate under any or all of the following philosophies. These podcasts and networks seek to cultivate relationships with their audiences and create more “premium” experiences. While podcasts may be freely accessible in order to grow listenership, listeners are encouraged to support the content makers via direct donations or a subscription model. Moreover, because the audience relationship with the host is so pivotal to this content, high-touch, host-read native ads (such as those heard in shows like Slate Money or WTF with Marc Maron) are more common in this model. Examples include: BuzzFeed, Audible, Panoply (podcasts add value to publishing partners). As the case studies illuminate, a major reason why media outlets and individual producers have been drawn to podcasting is the ability to engage directly and “own” a relationship with an audience. However, how direct is this relationship really? Much as online publishers are at the mercy of Facebook’s algorithm, so too are podcasters at the mercy of iTunes. The whole advantage of the platform—its access to huge audiences—is compromised by the simple fact that the audience “belongs” to iTunes (or Stitcher or Overcast). Podcasters cannot be certain who their listeners are. As much as podcasters attempt to circumvent this fate by creating their own apps (as has Intelligence Squared), or using metrics-focused players from SoundCloud or Acast (whose socially rich player can be embedded to keep listeners within an outlet’s own ecosystem), the fact remains that iTunes is the major way podcast listeners access audio content.132 Only Audible, which will produce audio accessible exclusively on its own platform, is exempt from this Catch-22. However, for podcasts that seek to reach large, mainstream audiences and earn advertising revenue from audience impressions, iTunes remains the most important platform for distribution. The ethical quandary of podcasting advertising, especially for shows that require a level of journalistic integrity, continues to be a concern for creators seeking advertising revenue. Many podcasters with whom I spoke maintained that while this murky ethical territory must be navigated carefully, both native ads and branded content offer meaningful potential for revenue generation. The most important mandate for podcasts is to be as transparent as possible so as to maintain credibility and avoid alienating audiences—their biggest assets. 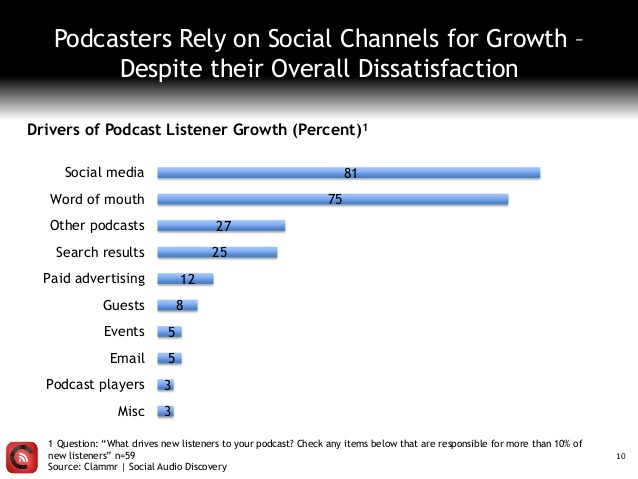 As Quah suggests, while networks are not necessary for podcasts, they can provide significant benefits. Although each podcast network operates differently, most take care of everything business-related, from negotiating with advertisers to marketing campaigns, in exchange for a cut of the ad revenue. For an independent show, a network can (1) provide advertisers, even if the show’s individual numbers would not otherwise merit advertiser interest; (2) offer the benefit of the network’s brand identity, which can allow a show to stand out to consumers; and (3) promote the show across other shows in the network. Despite their potential benefits for podcasters and advertisers, networks (by nature) face two central tensions that impact their efficacy. The first is a depreciating value over the long term: Once a show gains a significant audience, and quality advertisers as a result, it becomes incentivized to go solo (so it can earn advertising revenue directly rather than giving the network a cut). The second issue with networks is the lack of transparency regarding their show acquisition process. The greatest challenge most individual shows face is growing enough of an audience to gain advertisers (hence why networks are so useful). However, the majority of podcasters struggle to earn the attention of networks and/or advertisers, burn out by channeling time and resources without returns, and then go inactive. As sociologist Josh Morgan notes in his analysis of iTunes activity, over the last decade “a typical podcast ran for six months and 12 episodes, at two episodes per month, before going inactive.”144 Moreover, although many podcasts cite discovering new voices as a major priority, few have invested heavily in finding talent from beyond the public radio world (a notable exception would be the Loud Speakers Network, which has focused on generating content by and for people of color). Almost everyone I spoke to in the course of this research agreed that the one thing they are most excited to see in the future—before improved metrics, or business models, or new platforms—is further innovation and diversity of content. With this report, I have aimed to provide a detailed overview of the current podcasting landscape, and to answer three questions: what are the existing business models, how successful have they been, and how viable are they in the long term? While Serial generated much media attention, it did not prompt a spike in podcast audience growth, which has remained steady for years. 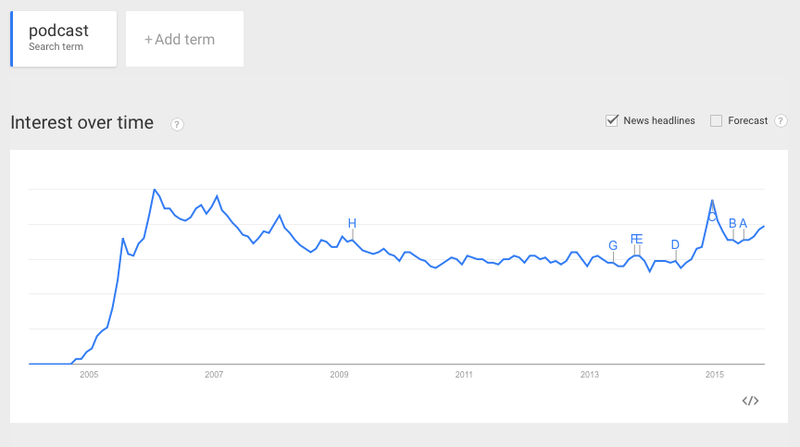 However, Serial did result in increased interest from advertisers and publishers looking to enter this space. Podcasts are finally positioned to achieve mainstream penetration, mostly because of mobile phone adoption and technologies that have lowered the barrier to entry. Although podcasts still face significant challenges—including a branding problem, ease of access (especially for Android users), and dashboard technology—these should be resolved in the following five years or so. The real challenge will be growing an audience that is comparable to that of other media, such as TV, radio, and video. Podcasting is also primed to attain legitimacy as an industry. Although download metrics remain rudimentary, streaming technology is allowing for more sophisticated statistics and increased consumer data. Moreover, industry standards are solidifying, which will allow podcasters to legitimize their numbers and appeal to more advertisers. What’s more, new podcasts and podcast networks are emerging and disrupting the radio ecosystem by attracting significant advertisers. As our world shifts to mobile consumption, these networks recognize the potential of podcasts as mobile-first content that engages with audience members in ways that no other mobile medium has previously. Because of podcast’s mobile advantage (and the promise of podcast ads as an antidote to the frustrating world of online display ads), advertising has become podcasting’s fastest-growing revenue stream. From the interviews conducted for this research, it seems many podcasts and networks remain reliant on advertising, but they are simultaneously exploring other revenue streams, mainly foundation grants, direct support, subscription models, and live events. These last three are of particular interest, as they rely on converting audience engagement and loyalty into recurring donations. Those that follow a “universal” philosophy hope to get their podcasts heard by as many people as possible (and thus logically rely on advertising as an important revenue stream). Those that follow a “premium” model attempt to convert listeners into recurring, loyal patrons via bonus offerings. Those that follow a “value-added” model use their podcasts as a means of enhancing both the consumer experience and the brand (and so revenue is not the primary goal). Of course, a podcast can ascribe to all of these philosophies and strategies simultaneously; nevertheless, I hope these concepts are helpful guides for understanding how podcasting revenue streams are prioritized and balanced. Although each of the companies profiled in the case studies are doing well financially, it is still too early to declare any podcast or podcast company a “success,” especially when so many of them rely heavily on advertising for income (experiments with direct support and live events remain just that—experiments rather than long-term strategies). Exceptions include those “value-added” companies such as Audible and BuzzFeed, which are essentially experimenting with audio, but not dependent on it for their lifeblood. Panoply is also notable in its pursuit of alternate and innovative revenue streams; however, one could argue that they too are overly reliant on advertising. Where podcasts seem to show the most potential (outside of advertising and branded content) is as an audience engagement tool that can generate support for direct donation and/or freemium models. Podcasts are remarkably suited to acting as complements to other kinds of content and to encouraging audience engagement in ways few other media can. If podcasts and podcast networks are to be economically viable over the long term, they must be cognizant of the strengths of the medium, which they should leverage to their advantage. There are many other questions left to explore regarding podcasting’s greater implications for journalism beyond the issues raised in this report. One route of interest, for example, could be to examine larger, established media organizations, such as CBS and ESPN, to understand how they are developing podcasts in relation to their radio offerings. Also of interest could be a more internationally focused study examining the ways government-sponsored broadcasting corporations affect the podcasting landscape in terms of opportunities for monetization and audience engagement. As this sphere changes daily, I have no doubt new questions, challenges, and opportunities for future research will emerge in the days, weeks, and years to come. Many thanks to Elizabeth Boylan, Pete Brown, Fergus Pitt, Benjamen Walker, Susan McGregor, and Emily Bell of the Tow Center for Digital Journalism for their support. Special thanks to Claire Wardle for generously giving me her time and fantastic feedback. Also thanks to all those who took the time to speak with me (on or off the record) for this project: Nick Quah (Panoply, Hot Pod), Robert S. Boynton (NYU), Tom Webster (Edison Research), Noah Shanok (Stitcher), Mark DiCristina (MailChimp), Jim Colgan (Audible), Brendan Monaghan (Panoply), Christa Scharfenberg (Reveal), Rob Walch (Libsyn), Steve Nelson (Infinite Guest), Jenna Weiss-Berman (BuzzFeed), Clea Conner Chang (Intelligence Squared), Jake Shapiro (PRX), Angela Stengel (First Run, ABC Radio), Kerri Hoffman (PRX), Hrishikesh Hirway (Song Exploder), Erik Diehn (Midroll Media), Steve Wilson (Apple), Seth Lind (This American Life), Parviz Parvizi (Clammr), Matt Lieber (Gimlet), Sarah van Mosel (New York Public Radio), Caitlin Thompson (Acast), Andy Bowers (Panoply), Jaclyn Friedman (Yes Means Yes), Mitra Kaboli (The Heart), Benny Becker (Israel Story), and Aaron Mahnke (Lore). the conclusion of PRX’s latest fundraising campaign for their podcast collective Radiotopia. This news, coupled with the inclusion and/or expansion of podcast content by other music streaming services such as Spotify, Pandora, and Deezer, suggests that the podcasting space will soon open up across platforms, potentially placing Apple’s relative monopoly on the format at risk. Acting essentially like a membership or subscription service, the campaign emphasized how donors can become integrated members of the Radiotopia community, receiving updates and extra content, invitations to storytelling workshops, and opportunities to evaluate pilot episodes of new shows. As PRX’s Director of Marketing, Maggie Taylor, explained in a blog post: “It gives us an opportunity to consistently connect with donors and fans, further cultivating and strengthening our community. It also means we will never start at zero again.” With its campaign, Radiotopia has eliminated the dependence on an intermediary like Kickstarter or iTunes and established a direct, potentially sustaining, relationship with its listeners. Since submitting my guide, Sarah van Mosel has announced she will leave her job as VP of Sponsorships at WNYC to join Acast as its Chief Commercial Officer. Gimlet has announced it will launch a second funding round on Quire (formerly Alphaworks), the online investing platform for US accredited investors. Audio: Audio is an umbrella term for all spoken-word content, including podcasts. Most of the shows referred to in this guide are podcasts; however, the shows being produced for Audible are audio, and not podcasts, because they will be self-published rather than distributed via an RSS feed (see podcast definition). Branded Content: Content created specifically with a company’s mission in mind. For example, British retailer Asos launched a podcast in partnership with Acast about female entrepreneurs to reach this specific demographic (the content is not about Asos; however, it is “presented by” Asos). This is distinct from native ads in podcasting—see native advertising. Carriage Fee: The fee a station pays to an audio producer for the right to broadcast its content over the airwaves (terrestrial radio). Also known as a licensing fee. Although podcasts can earn carriage fees, this is usually a supplemental rather than central source of revenue. CPMs: Clicks-per-mille (thousand). A standard way of charging for advertising in which advertisers pay a dollar rate according to every 1,000 impressions their ad receives. (If the CPM is one dollar, for example, the advertiser will pay 10 dollars for 10,000 impressions.) Because the only (somewhat) reliable podcasting metric is downloads, the CPM often represents the cost-per-thousand episode downloads. However, dynamic ad technology, which is quickly gaining popularity, allows ad impressions to be measured, and thus the CPM to be impressions-based. Direct Response Ads: Ads in which listeners are told of a special promo code or URL where they can receive a discounted offer for a product or service. The codes/URLs allow advertisers to track the number of listeners who convert into consumers. Although direct response advertising is most common on podcasts, brand advertising (ads that raise awareness of/positive associations with a company, without a specific call to action) is becoming more prevalent. Dynamic Ads: Most podcast ads are recorded by the podcaster and stitched to the podcast’s other segments in production; when the podcast is exported as an mp3, the ad is “baked in” the episode and cannot be measured separately from the episode itself. Dynamic ads, on the other hand, are injected into the podcast (at a certain point marked by the producer) the moment the episode is downloaded or, if streaming, the marker is reached. This means (1) the ad can be changed over time and (2) the ad can be inserted into previously released episodes. Dynamic ads can also be targeted: certain ads will be played according to listener behavior, location, etc. Often confused with programmatic ads (which are inserted dynamically). Hosting Platform: The hosting platform for a podcast is like the CMS of a website; it is what the platform creators use to upload their podcasts. From the hosting platform, content can then be distributed across platforms, from iTunes to apps. Popular hosting platforms include Libsyn and SoundCloud. Mid-roll Ads: Podcast ads are generally placed in one of three spots in a podcast episode—the very beginning (pre-roll), in the middle (mid-roll), or at the very end (post-roll). In general, pre-roll and mid-roll ads are more valuable than post-roll ads, since there is a lesser likelihood listeners will consume the entire episode and hear the post-roll. Native Advertising: Like an advertorial, a native ad mimics the feel of editorial content; in audio content, it is generally the host who creates and presents the native ad (rather than an external voice who reads the ad copy created by the company). For example, a native ad can include interviews with the sponsor and/or personal stories from the host. Although, according to journalistic ethics, the host should not endorse the product personally, this is a frequent hazard of native advertising. Native Apps: Apps (application programs) developed for a specific platform or device. Also used to refer to the preinstalled, undeletable apps that come with the iPhone’s operating systems, which is the definition I use in this guide. Podcast Networks: A grouping of podcasts that share resources. Often formed to pool audience sizes and increase advertiser appeal. Sponsorship: Although often confused with advertising, sponsorship is a way of acknowledging companies for their support without promoting a product or service. This distinction, although somewhat irrelevant in podcasting, is important in broadcasting. Public radio programs can acknowledge sponsors on the air without breaking FCC regulations, but they legally cannot read ads. Also known as underwriting. i: See glossary for definition. ii: See glossary for definition. Darren Rowse, “What Is RSS?” problogger.net, http://www.problogger.net/what-is-rss/. “History of Podcasting,” Wikipedia, https://en.wikipedia.org/wiki/History_of_podcasting. Steve Jobs Announces Switch to Intel and Podcasting (21 December 2013), https://www.youtube.com/watch?v=K0KNLCbzZUw. 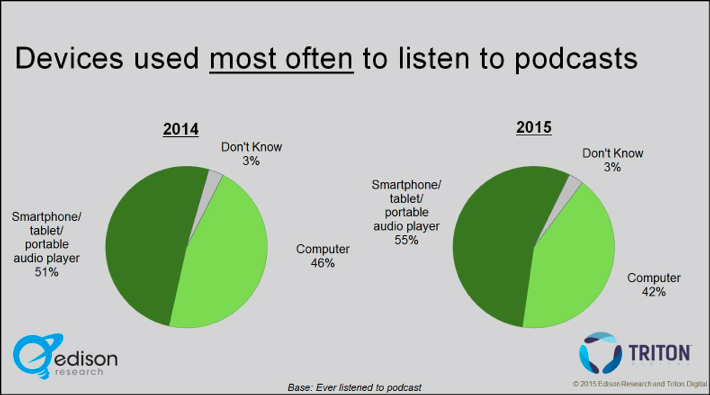 “The Podcast Consumer 2015,” Edison Research, 25 June 2015, http://www.edisonresearch.com/the-podcast-consumer-2015/. Max Linsky, “Longform Podcast #159: Ira Glass,” Longform, 23 Sept 2015, http://longform.org/posts/longform-podcast-159-ira-glass. Jonah Bromwich, “After ’Serial,’ What Podcasts to Listen To,” The New YorkTimes, 2 October 2015, http://www.nytimes.com/2015/10/01/business/media/after-serial-what-podcasts-to-listen-to.html?_r=0. Pete Davies, “Downloads, Listens, Listeners, and About Those Podcast Num-bers,” Medium, 12 December 2014, https://medium.com/@pete/downloads-listens-listeners-and-about-those-podcast-numbers-73a5ee3e2fca. Clark Buckner, “Libsyn Sees Record Podcast Network Growth in 2014,” Libsyn,19 February 2015, http://www.libsyn.com/wp-content/uploads/2015/06/PRLibsynNetGrowth021915Final.pdf. Interview with Seth Lind, This American Life, on 21 August 2015. Interview with Rob Walch, Libsyn, on 13 August 2015. “State of the Media: Audio Today—How America Listens,” Nielsen, 5 March 2015,http ://www. nielsen.com/us/en/insights/reports/2015/state-of-the-media-audio-today-how-america-listens.html; “Statistics and Facts on the U.S. Radio In-dustry,” Statista, http://www.statista.com/topics/1330/radio/. “Panoply Acquires Next Generation Ad Management and CMS Technology forPodcasters and Podcast Networks,” Panoply Media, 11 August 2015, http://panoplymedia.tumblr.com/post/126434082888/panoply-acquires-next-generation-ad-management-and. Josh Morgan, “How Podcasts Have Changed in Ten Years: By the Numbers,”Medium, 2 September 2015, https://medium.com/@slowerdawn/how-podcasts-have-changed-in-ten-years-by-the-numbers-720a6e984e4e. 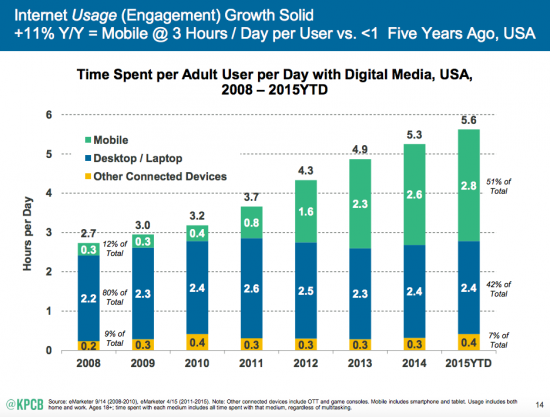 Dave Chaffey, “Insights From KPCB U.S. and Global Internet Trends 2015 Re-port,” Smart Insights, 11 June 2015, http://www.smartinsights.com/internet-marketing-statistics/insights-from-kpcb-us-and-global-internet-trends-2015-report/. Interview with Angela Stengel, ABC, on 3 August 2015. Interview with Jenna Weiss-Berman, Buzzfeed, on 7 August 2015. Dave Chaffey, “Display Advertising Clickthrough Rates,” Smart Insights, 21 April2015, http://www.smartinsights.com/internet-advertising/internet-advertising-analytics/display-advertising-clickthrough-rates/. Interview with Mark DiCristina, Mailchimp, on 3 September 2015. Interview with Sarah van Mosel, New York Public Radio, on 7 September 2015. Interview with Caitlin Thompson, Acast, on 17 August 2015. Adam Sachs, “The Wolf Den #88: David Raphael, CEO of Public Media Mar-keting,” Earwolf, 17 September 2015, https://soundcloud.com/the-wolf-den/88-david-raphael-ceo-of-public-media-marketing. Phil Edwards, “Why Podcasts Have Such Terrible Ads &Eacute;,” Vox, 28 September2015, http://www.vox.com/2015/9/28/9408375/podcast-ads. Interview with Mark DiCristina, Mailchimp. Interview with Matt Leiber, Gimlet Media, on 28 July 2015. Interview with Sarah van Mosel, New York Public Radio. Interview with Seth Lind, This American Life. Tyler Falk, “Ira Glass Starts Own Company for ’This American Life,’ ’Serial’,”Current, 10 July 2015, http://current.org/2015/07/ira-glass-starts-own-company-for-this-american-life-serial/. Interview with Noah Shanok, Stitcher, on 17 September 2015. Interview with Andy Bowers, Panoply, on 2 October 2015. “Podcasts by the Numbers,” Midroll Media, http://awesome.midroll.com. Interview with Clea Conner Chang, Intelligence Squared, on 30 July 2015. This American Life, “How to Listen to a Podcast With Ira and Mary,” 3 Oc-tober 2013, https://www.youtube.com/watch?v=8IPV2oSz8m4. Lily Hay Newman, “Android Users Won’t Drop Money on Just Any App,” Slate,26 June 2014, http://www.slate.com/blogs/future_tense/2014/06/26/there_are_twice_as_many_android_users_as_ios_but_ios_users_spend_double.html. Interview with Rob Walch, Libsyn. “Clammr Future of Podcasting 2015,” Clammr, 16 July 2014, http://www.slideshare.net/clammrapp/20150617-future-of-podcasting-2015-clammr-v-f.
Interview with Caitlin Thompson, Acast. Interview with Andy Bowers, Panoply. Interview with Parviz Parvizi, Clammr, on 25 July 2015. Nicholas Quah, “This American Life’s Audio Hackathon, the End of an Indie Pod-cast, and Audible’s New Hire,” Hot Pod/Nieman Journalism Lab, 22 September 2015,http://www.niemanlab.org/2015/09/hot-pod-this-american-lifes-audio-hackathon-the-end-of-an-indy-podcast-and-audibles-new-hire/. Kevin Roose, “What’s Behind the Great Podcast Renaissance?” New York Mag-azine, 30 October 2014, http://nymag.com/daily/intelligencer/2014/10/whats-behind-the-great-podcast-renaissance.html%5C#. John McDuling, “The Remarkable Resilience of Old-Fashioned Radio in the U.S.,”Quartz, 4 April 2014, http://qz.com/195349/the-remarkable-resilience-of-old-fashioned-radio-in-the-us/. Interview with Matt Leiber, Gimlet Media. Adam Clark Estes, “Chevy Is Bringing Apple CarPlay and Android Auto to theMasses,” Gizmodo, 27 May 2015, http://gizmodo.com/chevy-is-bringing-apple-carplay-and-android-auto-to-the-1707219276. Richard Core, “How Your Car Is Becoming the Next Hot Tech Gadget,” Forbes,23 September 2015, http://www.forbes.com/sites/samsungbusiness/2015/09/23/how-your-car-is-becoming-the-next-hot-tech-gadget/. Jim Henry, “Average Car in the U.S. Now Over 10 Years Old, a Record,” Forbes,20 January 2012, http://www.forbes.com/sites/jimhenry/2012/01/20/average-car-in-the-u-s-now-over-10-years-old-a-record/. Eric Blattberg, “The Measurement Challenge Facing Podcast Advertising,” Digi-day, 5 February 2015, http://digiday.com/platforms/measurement-challenge-podcast-advertising/. Interview with Jake Shapiro, PRX, on 31 July 2015. Interview with Nicholas Quah, Panoply, on 24 August 2015; Caitlin Petre, “TheTraffic Factories: Metrics at Chartbeat, Gawker Media, and The New York Times,”Tow Center for Digital Journalism, 7 May 2015, http ://towcenter . org/research/traffic-factories/. Interview with Jake Shapiro, PRX. Radio Ambulante, “” Kickstarter, 25 January 2012, https://www.kickstarter.com/projects/1255653356/radio-ambulante/description. Andrew Lapin, “Podcast With Limited Radio Airplay Sets Kickstarter Record,”Current, 20 August 2012, http://current.org/2012/08/podcast-with-limited-radio-airplay-sets-kickstarter-record/. Vignesh Ramachandran, “Radiotopia Sets Record for Publishing and Radio Fund-ing on Kickstarter,” Knight Foundation blog, 14 November 2014, http://knightfoundation.org/blogs/knightblog/2014/11/14/radiotopia-sets-record-for-publishing-and-radio-funding-on-kickstarter/. Justin Ellis, “Knight Foundation Invests $1 Million in Creator-Driven PodcastCollective Radiotopia,” Nieman Journalism Lab, 12 May 2015, http://www.niemanlab.org/2015/05/knight-foundation-invests-1-million-in-creator-driven-podcast-collective-radiotopia/. James Risley, “Amazon’s Audible Hires NPR VP of Programming, Signaling Moveinto Original Podcasting,” GeekWire, 16 May 2015, http://www.geekwire.com/2015/amazon-makes-moves-into-original-podcasting-hires-npr-vp-of-programming/. E-mail message to author, on 3 October 2015. Kaboli E-mail message to author; E-mail message to author, on 3 October 2015. Adam Sachs, “The Wolf Den #87: Lea Thau, Creator and Host of Strangers,” Earwolf, 3 September 2015, https://soundcloud.com/the-wolf-den/87-lea-thau-creator-and-host-of-strangers. Tiziano Bonini and Belén Monclús (eds. ), Radio Audiences and Participation in the Age of Network Society (2014). New York and London, Routledge. Interview with Christa Scharfenberg, Reveal, on 13 August 2015. E-mail message to author, on 6 October 2015. Scharfenberg E-mail message to author. Interview with Christa Scharfenberg, Reveal. E-mail message to author, on 9 October 2015; Ann Friedman, “The Economicsof the Podcast Boom,” Columbia Journalism Review, 20 March 2015, https://www.cjr.org/first_person/the_economics_of_the_podcast_boom.php. Alex Blumberg, “StartUp Season 1,” Gimlet Media, 7 July 1905. Interview with Jenna Weiss-Berman, Buzzfeed. Slate, “Slate Group Announces Panoply, a Podcasting Network for Media Brandsand Authors,” 25 February 2015, http://www.slate.com/articles/briefing/slate_fare/2015/02/panoply_slate_group_announces_new_podcast_network.html. Interview with Brendan Monaghan, on 26 August 2015. Interview with Brendan Monaghan; Joseph Lichterman, “How Podcasters AreTurning to New Technologies and Partnerships to Introduce Programmatic Ads,” Nie-man Journalism Lab, 24 August 2015, http://www.niemanlab.org/2015/08/how-podcasters-are-turning-to-new-technologies-and-partnerships-to-introduce-programmatic-ads/. Jessica Toonkel, “General Electric Producing Science Fiction Podcast Series,”Reuters, 2 October 2015, http://www.reuters.com/article/2015/10/02/ge-podcasts-idUSL1N11Y1D120151002. Interview with Nicholas Quah, Panoply. Interview with Aaron Mahnke, Lore, on 5 October 2015. Interview with Clea Conner Chang, Intelligence Squared. Joe Nocera, “Stepping on a Slippery Slope,” The New York Times, 28 July2015, http://www.nytimes.com/2015/07/28/opinion/joe-nocera-stepping-on-a-slippery-slope.html. Nicholas Quah, “Patronage, Screenshorting Audio, and the Cleveland Browns,”Nieman Journalism Lab, 8 September 2015, http://www.niemanlab.org/2015/09/hot-pod-patronage-screenshorting-audio-and-the-cleveland-browns/. Interview with Hrishikesh Hirway, Song Exploder, on 4 August 2015. Vanessa Quirk, “The Curious Success of Lore: A Case Study,” Tow Center forDigital Journalism, 7 October 2015, http://towcenter.org/case-study-lore. Interview with Kerri Hoffman, PRX, on 6 August 2015. Mark Bergen, “Google Brings Podcasting to Play Music, Swinging at Apple’sDominance,” re/code, 27 October 2015, http://recode.net/2015/10/27/google-brings-podcasting-to-play-music-swinging-at-apples-dominance/. Janko Roettgers, “Pandora Is Acquiring Music Streaming Service Rdio For $75Million (Exclusive),” Variety, 16 November 2015, http://variety.com/2015/digital/news/pandora-rdio-acquisition-1201641583/. Laura Hazard Owen, “How did the GE-branded podcast The Message hit No.1 on iTunes? In part, by sounding nothing like an ad,” Nieman Journalism Lab, 30November 2015, http://www.niemanlab.org/2015/11/how-did-the-ge-branded-podcast-the-message-hit-no-1-on-itunes-in-part-by-sounding-nothing-like-an-ad/. Shannon Bond, “Brands tune into podcast production,” Financial Times, 23 Novem-ber 2015, http://www.ft.com/cms/s/0/d153ee44-8fd6-11e5-8be4-3506bf20cc2b.html%5C#ixzz3tASSyhK9. StartUp, “#17 Words About Words From Our Sponsors,” Gimlet Media, 19 Novem-ber 2015, https://gimletmedia.com/episode/17-words-about-words-from-our-sponsors/. Maggie Taylor, “The Coin, the Quilt and the Superfan: Radiotopia FundraisingLessons,” PRX, 24 November 2015, http://blog.prx.org/2015/11/the-coin-the-quilt-and-the-superfan-radiotopia-fundraising-lessons/. Joseph Lichterman, “How PRX and Radiotopia are rethinking the public radiopledge drive for the podcast era,” Nieman Journalism Lab, 27 October 2015, http://www.niemanlab.org/2015/10/how-prx-and-radiotopia-are-rethinking-the-public-radio-pledge-drive-for-the-podcast-era/. “Podcasting Terms: Glossary,” WhatIs.com, http://whatis.techtarget.com/reference/Podcasting-Terms-Glossary. Vanessa Quirk Vanessa Quirk recently graduated from Columbia’s Journalism School with a Master of Arts in Arts & Culture Journalism. Previously, she was working as the Managing Editor of ArchDaily, the world’s most visited architecture site, in Santiago, Chile. Quirk completed her undergraduate work in English Literature at the George Washington University and Oxford University.